I am grateful for those good wishes.And I am having a good time. Getting to know 27 interesting and like-minded (at least on one subject) new friends. Seeing sights that are fascinating, some of them beautiful. Spending time in this place that I love (no, that is not the drama queen speaking). However, the purpose of my visit is not to have a good time. Anyone who knows me knows that. The purpose is to see once again so I can talk and write about with some tiny bit of insight the horrors of the situation “on the ground” here. 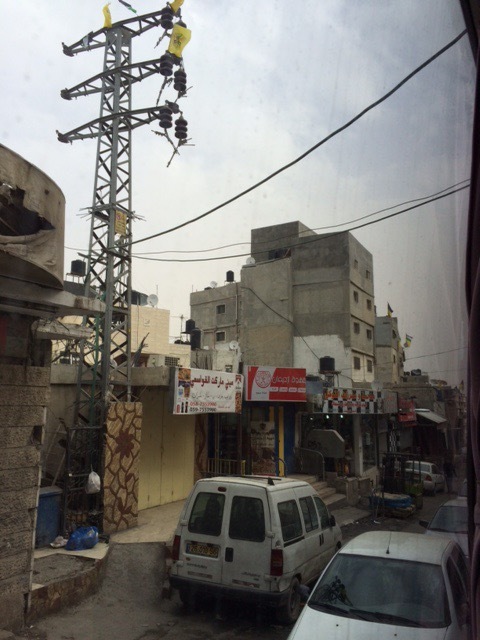 The situation for the Palestinian people has deteriorated almost beyond belief since I was here in 2008. I do not know how the Palestinians do anything other than simply to give up hope. To a person, woman, man, and child, they are made of stronger stuff than I or, I fear, most of my friends. 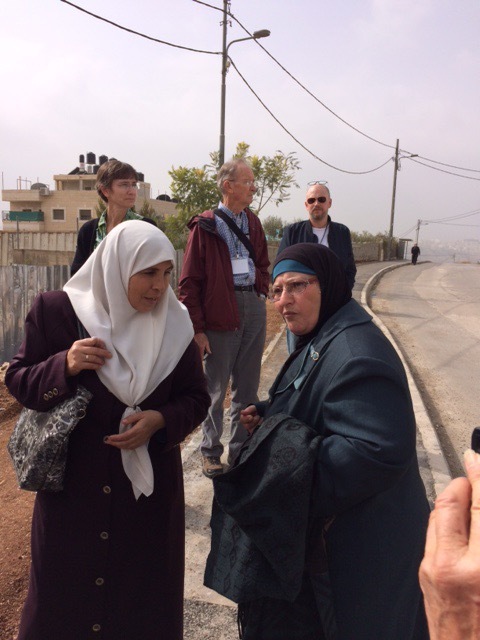 Two days ago we passed through an illegal Jewish settlement on the way to the Shufat refugee camp. The settlement is a lovely, clean, well-kept, green-lawned upper-middle-class neighborhood. The kind of place anyone reading this would like to live. Shufat is a neighborhood where the city (Jerusalem) does not pick up garbage, does not repair streets, does not repair traffic signals (none in the entire Camp works), does not provide basic services such as delivery of water and electricity, does not police (to use the word incorrectly, “literally”). The city does not even pay to educate their children, but leaves that expense to the United Nations. 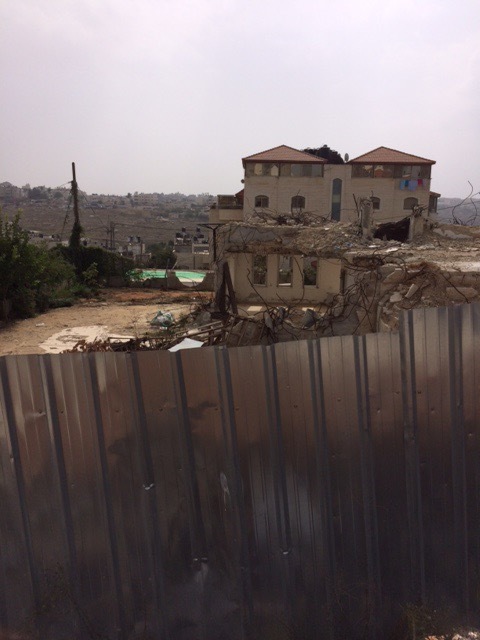 The one stop we made in Shufat was to look at the ruins of a home demolished by the Israeli government, demolished it because it was built without a permit (50 years ago). We took pictures and, as good empathizers would, wrung our hands in dismay. And then two women walked up the street to see what we were doing. Two neighbors. Our leader Omar talked with them and translated for us. They live in fear that they may be the next to receive demolition orders for their homes. They try to impress on their children that they must never do anything provocative ( or even go near) an Israeli soldier for fear of being shot dead for no reason. One of our group asked Omar to ask them what brings them happiness. Nothing. They are not happy. They simply live in hope and trust Allah to save them. A chance encounter, and we know more clearly than we wish we did how the Apartheid regime of the last 48 years has all but destroyed the lives of the Palestinians. I am not yet able emotionally to write about seeing Ofer Prison (for political detainees), about which I read so much in the daily news from Palestine for my blog Palestine InSight. Yesterday we visited the Apartheid Wall in Bethlehem. No comment is necessary except to say that the Israelis continue extending the wall. Soon Bethlehem will be completely surrounded — and, like all other cities in Palestine, an open air prison for 100,000 people. The only difference between the lives of the Palestinians and the lives of the black Africans in Apartheid South Africa will be that here there are actual physical walls around the Bantustans. An illegal Israeli “settler” home on stolen property, paid for by taxes on Palestinian homes. 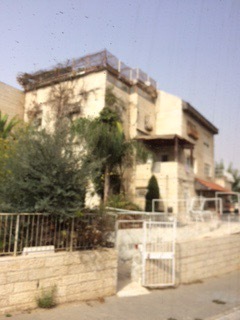 Pisgat Zeev “settlement,” Jerusalem.